This past weekend, we had a family outing to see Monsters University, the prequel to Pixar's Monsters Incorporated. It's been long enough that this movie has been out that we were the only ones in the theater, which was cool. So we could perhaps laugh a little louder than we otherwise would, and we could even make comments to each other if we wanted, particularly if Coffeeson needed help understanding something. We meet up with Mike and Sully--as well as some other familiar monsters from the first movie--as they're attending college. Surprise premise based on the name, right? Mike is the dedicated student, the one who needs to work hard for everything he's given in order to be what he's always dreamed of: a scarer at Monsters Incorporated. He always has his monster nose buried in a book, gobbling up every factoid and technique that he can in order to keep up with the others in his class. Sully, meanwhile, is the one with more natural abilities. He already looks like a scarer, he has a terrifying roar, and he's a legacy student whose family is legendary in the field. He doesn't spend much time studying so much as partying with the popular fraternity and resting on his laurels. As the movie goes on, we realize that these two need each other for more than one reason. They are so complementary in various ways, which sets the tone for their relationship in the later/earlier movie. One of the most interesting features of this movie is that there isn't a true "bad guy," an easy and obvious foil trying to plot the pair's downfall or attempting to sabotage them at every turn. There are certainly those who could fit the bill, such as the popular fraternity with whom they compete at various points in the movie, or the dean of the scaring department who appears aloof and critical, but only because she holds students in her program to a high standard. The biggest foils in the movie turn out to be Mike and Sully themselves. Each of them have shortcomings and hang-ups; each have obstacles that in part they set in their own way. That's more what this movie is about: it's a coming-of-age story where the monsters discover how to use their strengths and rely on each other in their weaknesses. It is a tale of friendship and teamwork; of learning that we can't accomplish what we need to do on our own. 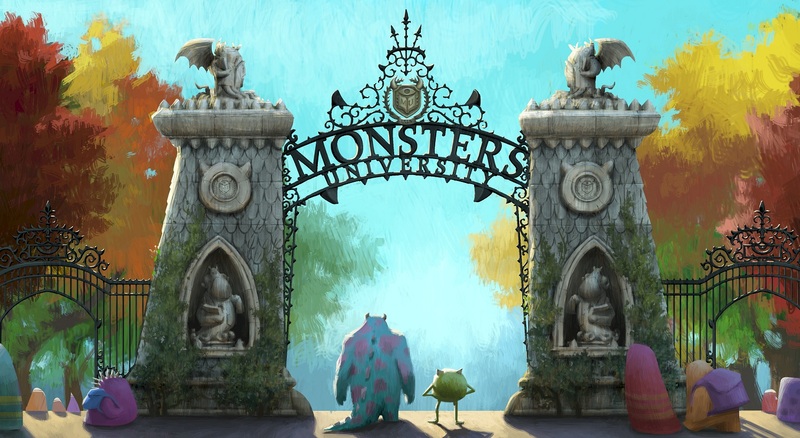 Monsters University points out one of the basic truths of life, much less theology: we're really good at standing in our own way. Some of it is inevitable: we are given certain talents or physical capabilities and likewise lack others. How will we not only cultivate what we have, but also "bear one another's burdens," as yesterday's Galatians passage talks about? One dimension of that question is how will we allow others into our lives enough to bear them, rather than insist that we can do things ourselves even when we so clearly cannot? Trust and humility are essential elements to being in community. It takes a while for Mike and Sully to learn these lessons, and it's no different for us.